A brilliant pearly disk rotating on its own axis and emitted rays of colored lights in all directions. A silvery object. Two hemispheres divided by a rotating ring. The object shoots a beam of light. W.W. II. 1944. Kaneohe, Oahu, Hawaii. E.L. (initials), serving as Carpenter Mate, 1st Class, Hqt. Co. 112th Construction Battalion, came across a landed saucer near a wooded ridge, near the beach of Kaneohe, Oahu, Hawaii. Description: 50 ft. diam. ; metallic; looked like an igloo; topped with a clear glass dome about a foot high with a gold colored weather vane-like device spinning inside. "From the swirling effect of the glowing 'ehaust' I got the impression that the whole object was spinning like a top." Two silvery flying disks. Spinning motion was apparent on film. Robert Frenhoff. "I happened to glance up into the evening sky, when I was surprised to see a queer thing like a child's gyroscope or spinning top, whirling along at a great altitude." A rotating cupola on top of the craft changed from red to green as it decelerated. The base of the saucer appeared to be rotating, and the object emitted a low humming noise. Looking up, he saw a large round object with a rotating light on top swoop out of the sky and land on the shore. Actor Jaime Farr (M*A*S*H) driving down desert road. Caught sight of a light zigzagging across sky at incredible speed. Stopped in mid-air, hoverd for a while, took off at high speed. The UFO approached within one hundred yards of car, then paced it. Could distinquish a domed apparatus with a light swinging around its base. The desert sand swirled underneath it. Singer Buddy Greco saw a metallic dome spinning on the ground. Brilliant white lights flashed around its rim. Object rose vertically and shot up into the sky at incredible speed. Charles Brew, Trevor Brew. The base or underside section glowed with a pale blue colour and had 'scoop-like protuberances around the outside edge'. This section rotated slowly at about one revolution per second. This spinning motion apparently caused the protuberances to generate a swishing noise, somewhat like a turbine noise, that was clearly audible not only to Brew but also to his son Trevor, who was located inside the shed near the operating diesel-powered milking machine units. Suddenly a multicoloured band began to rotate inside the windows and a witish mist thickened around the object, wich emitted a faint hum. The witnesses became aware of a sulphurous smell. Mrs. Helen Reed. She estimated that the object was no more than 15 feet in diameter and she later described a series of round, yellow lights that encircled the base. She said that these lights were "brighter than headlights" but caused her no discomfort as she observed them. The outer ring between the blue light and the rim was rotating counterclockwise, casting off a halo of light that changed from orange to white with an overall tinge of blue and green. The craft, always silent, began to rotate slowly so as to give everyone inside a good look at the witness. Arvi Juntunen. 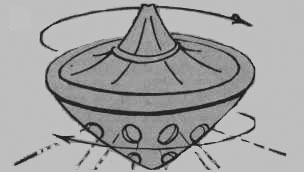 A saucer-like object flying just above the ground. Device was brownish, it had diameter not more than 80 cm and it caused little hum. After first witness tried to get close to the object, he sensed weak electrical shock in his body after the object started to move and three antennas arose from it. He wasn’t able to get much closer as the device was moving and his hat, which he threw towards the UFO, fled almost 15 meters away from it because of the strong whirlwind as the device was moving. The object displayed a distinct whirling motion, as it rotated about its central axis. Reported R.C. Hecker, an investigator for the Aerial Phenomena Research Organization. Circular object with rotating blue and yellow lights, hovers over a tree and gives off a high pitched sound. The whole family watched as a glowing white oval object slowly rose up out of the creek bed and flew away to the northeast where it assumed a dark oval shape with green and red lights revolving around its edge or middle. On Tuesday, February 8, Mrs. Gayle Rodriguez and her son, Brian, watched a similar UFO show by a rather differently shaped object. Driving east on St. Bernard highway they saw a brightly lit silvery colored craft which flew across the highway in front of them and began a course parallel to the road. Its movement was in uneven spurts, shooting forward and then stopping. On one stop it tilted toward the car. It was shaped like an upside down saucer with a flat bottom and a dome on top in the middle. Near the bottom edge could be seen a row of individual lights which merged into a single blur when rotating. The lights changed color, alternating between blue, green and bright white. Atop the dome were three lights on the ends of which appeared to be antenna: two small white lights, and one larger red light. Mrs. Gayle Rodriguez. Near the bottom edge could be seen a row of individual lights which merged into a single blur when rotating. The lights changed color, alternating between blue, green and bright white. Atop the dome were three lights on the ends of which appeared to be antenna: two small white lights, and one larger red light. Disc with dome and 3 lights (red, green and white) revolving around it is observed shooting off sparks. It was slowly rotating clockwise and at so low an altitude (my guess is less than 1000 feet) as to make identification easy (for me, being familiar with conventional aircraft design). The disc was slightly tilted and rotating counter clockwise. Both men timed the rotation at 9 rpm. The object glowed yellow. Electric-like energy sparks ran around the disc in a clockwise direction. These were blue. As the arc touched the center of the tubes, the ends lit up. As the arc touched the ends, the centers lit up.Twenty two minutes later, the object started spinning faster and faster and got as bright as it had been earlier when responding to the lightbeam signals. Suddenly, without a sound, it took off up and to the northwest until it looked like a yellow star. That was the last they saw of it. Police officer Alan Godfrey. It was a fuzzy oval that rotated at such speed and hovered so low over the otherwise deserted highway that it was causing the bushes by the side to shake. Bob Pozzuoli. We now saw a string of multicolored lights in the shape of a disc with a red light flashing behind it. The lights appeared to be rotating. A dark line seemed to rotate inside the windows. Raul Dominguez. It was a machine that I believe was about 25 meters in diameter. The lower half revolved. I didn't notice any noise until it was very close to me. I heard it when it was 10 to 12 meteres above my head and I heard a sound like bees buzzing. I felt my hair brisling and my close moved as well as my hair. Witness observes a luminous conical (cone-shaped) form turning around its axis and comprising on its circumference stripes of various colors. In addition, as the object appeared to increase its altitude, the elk, which was suspended upright below the disc, rotated slowly beneath it and appeared to be getting closer to the ventral surface of the disc. Jose Da Silva. Immediately the object began to spin very rapidly and rose slowly. It spined at about 20 mph.